Download "Filing Fee $117.00. 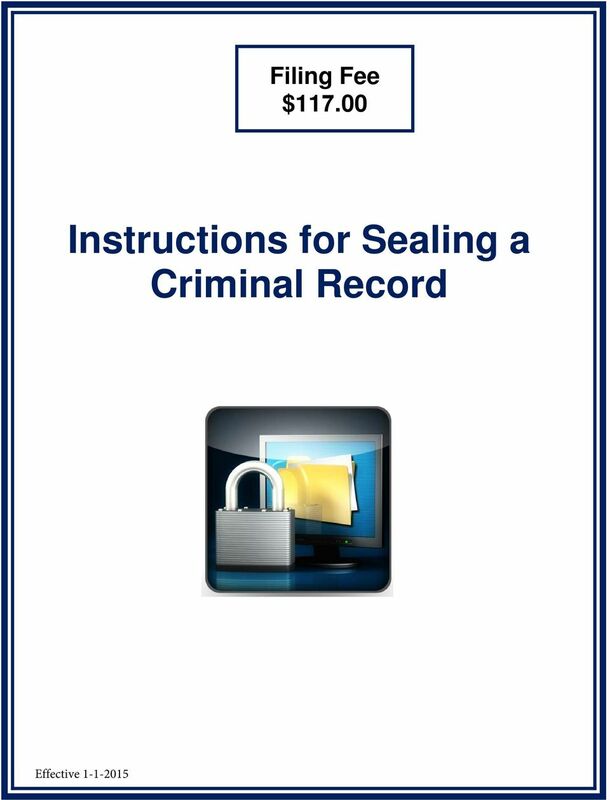 Instructions for Sealing a Criminal Record"
2 This packet is to be used to assist you in filing an application to seal your criminal record. * * * * * * * * * * * * * * * * * * * * * * * * * * * * * * * * The staff of the Elyria Municipal Court Clerk s Office, by law, is prohibited from offering ANY legal advice. Please contact an attorney with any questions regarding the sealing/expungement application process. 3 Sealing of a Record In Ohio, records of conviction, bail forfeiture, not guilty or dismissal may be sealed. Sealing of a record, is the act or practice of officially preventing access to court records. In most instances after sealing, the record of conviction is treated as if it never occurred. (See ORC in the appendix for exceptions.) 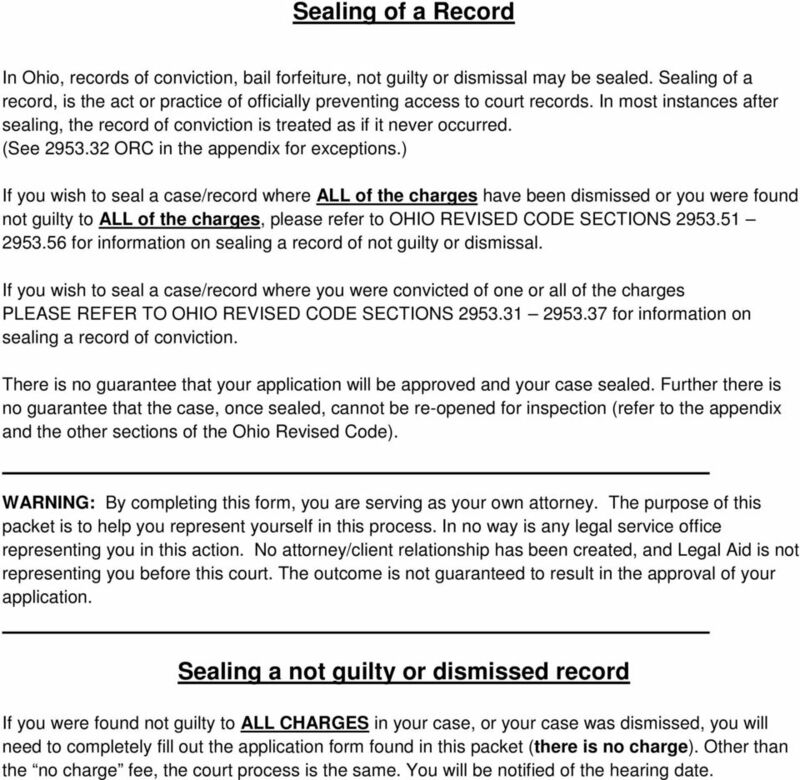 If you wish to seal a case/record where ALL of the charges have been dismissed or you were found not guilty to ALL of the charges, please refer to OHIO REVISED CODE SECTIONS for information on sealing a record of not guilty or dismissal. 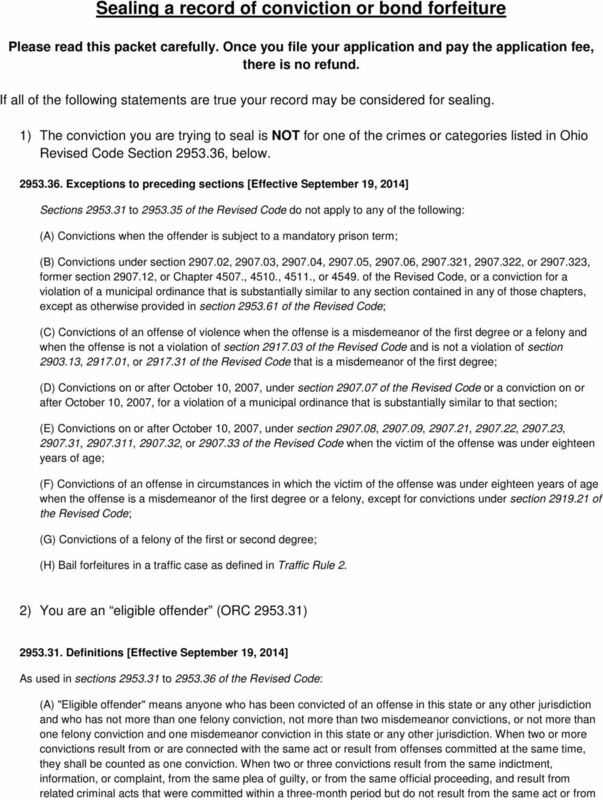 If you wish to seal a case/record where you were convicted of one or all of the charges PLEASE REFER TO OHIO REVISED CODE SECTIONS for information on sealing a record of conviction. There is no guarantee that your application will be approved and your case sealed. Further there is no guarantee that the case, once sealed, cannot be re-opened for inspection (refer to the appendix and the other sections of the Ohio Revised Code). WARNING: By completing this form, you are serving as your own attorney. The purpose of this packet is to help you represent yourself in this process. In no way is any legal service office representing you in this action. No attorney/client relationship has been created, and Legal Aid is not representing you before this court. The outcome is not guaranteed to result in the approval of your application. Sealing a not guilty or dismissed record If you were found not guilty to ALL CHARGES in your case, or your case was dismissed, you will need to completely fill out the application form found in this packet (there is no charge). Other than the no charge fee, the court process is the same. You will be notified of the hearing date. 5 offenses committed at the same time, they shall be counted as one conviction, provided that a court may decide as provided in division (C)(1)(a) of section of the Revised Code that it is not in the public interest for the two or three convictions to be counted as one conviction. For purposes of, and except as otherwise provided in, this division, a conviction for a minor misdemeanor, for a violation of any section in Chapter 4507., 4510., 4511., 4513., or of the Revised Code, or for a violation of a municipal ordinance that is substantially similar to any section in those chapters is not a conviction. However, a conviction for a violation of section , , , , , , or or sections to of the Revised Code, for a violation of section or of the Revised Code that is based upon the offender's operation of a vehicle during a suspension imposed under section or of the Revised Code, for a violation of a substantially equivalent municipal ordinance, for a felony violation of Title XLV of the Revised Code, or for a violation of a substantially equivalent former law of this state or former municipal ordinance shall be considered a conviction.. 3) You were convicted of a misdemeanor and more than one year has passed since your final discharge, or you were convicted of a felony and more than three years have passed since your final discharge. Final discharge means completion of jail and or probation. 4) There are no fines or costs owed on the case. Sealing the record process 1) Fill out an application form included in this packet. 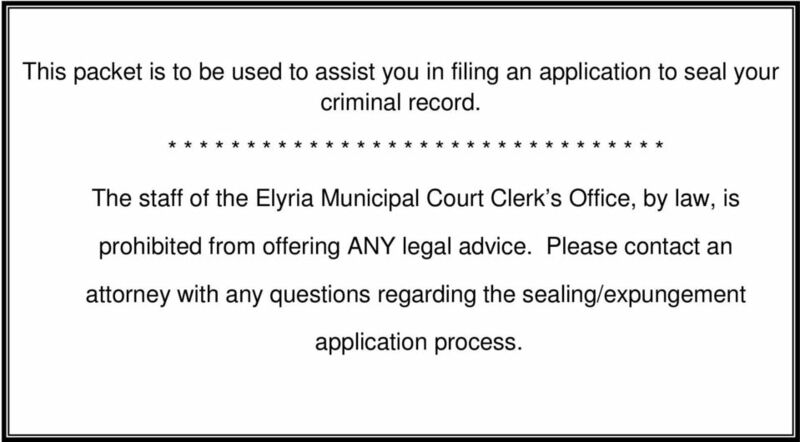 2) File the application with the Clerk of Elyria Municipal Court. 3) Pay the application fee. (For each case) 4) If you cannot pay the fee, you will need to go to the local public defender/legal aid office and obtain a Poverty Affidavit form and turn it in with your application. 5) Ask for a time stamped copy of your application. 6) You will be notified of the hearing date. 7) Appear in court for your hearing. 8) If the application is approved, the court will order your case sealed. The clerk s office cannot give you an estimate of the time it will take to seal your record. Once the court approves your application and orders your record sealed, all agencies involved will be notified. The amount of time these agencies need to process a request is beyond the control of the clerk s office or the court. 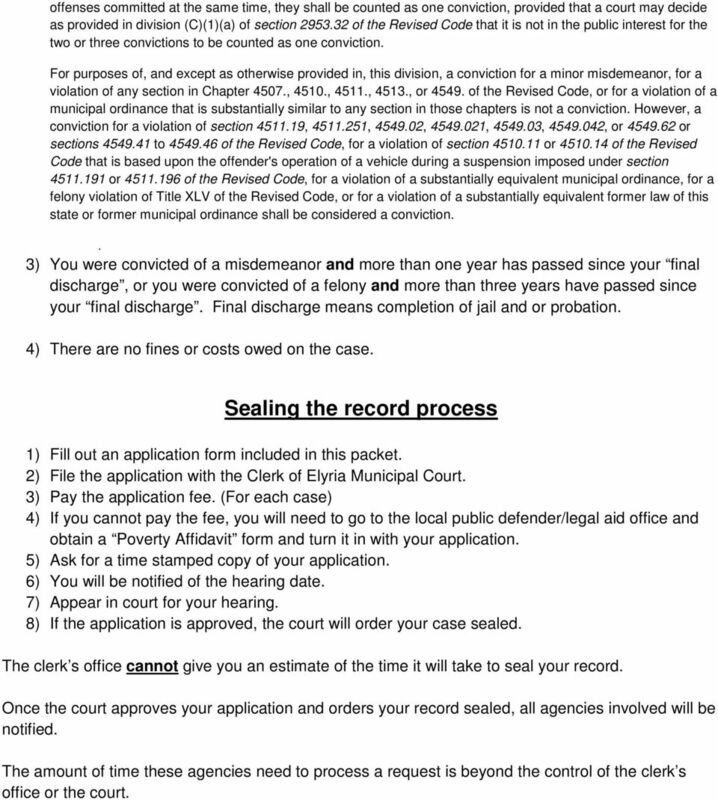 6 ELYRIA MUNICIPAL COURT APPLICATION TO SEAL THE RECORD City/State of Ohio (Please Print) VS. Defendant/Applicant (Please Print) * Case #(s): * Judge APPLICATION FOR ORDER SEALING RECORD OF CONVICTION(S), FINDING(S) OF NOT GUILTY AND/OR DISMISSAL(S) Defendant hereby makes application to the Court pursuant to Ohio Revised Code and/or for the sealing of the conviction, finding of not guilty, and/or dismissal record in the above-stated case(s). Defendant hereby provides the following information: 1. Case(s) to be sealed: 2. Date(s) of conviction/dismissal/not guilty: 3. If Probation, date terminated: 4. Current address of applicant: 5. Applicant s telephone #: 6. Applicant s Driver s License No. : Defendant states that he/she is an eligible offender, that any rehabilitation has been attained to the satisfaction of the court; and, that the interests of defendant in having the records pertaining to this conviction, dismissal and/or finding of not guilty are not outweighed by any legitimate governmental needs to maintain those records. 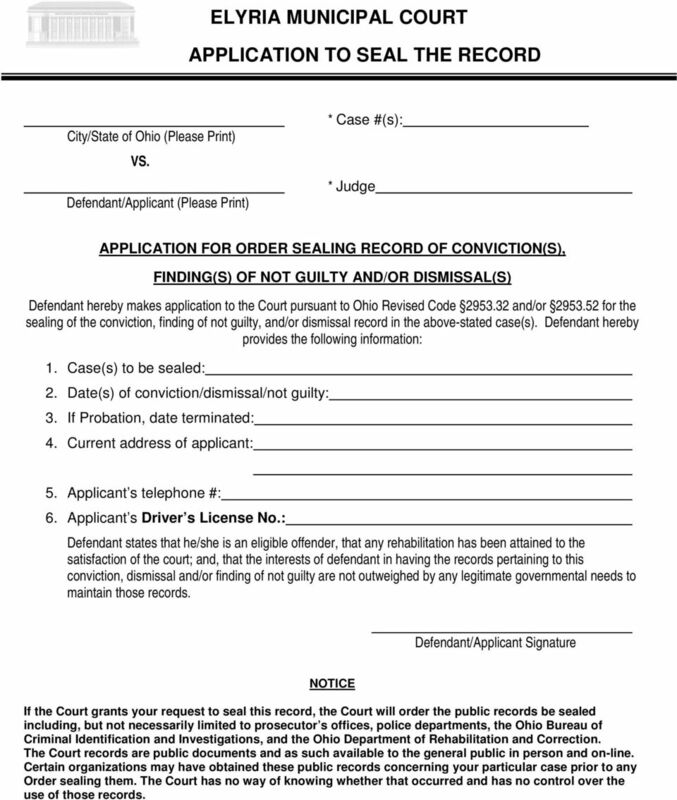 Defendant/Applicant Signature NOTICE If the Court grants your request to seal this record, the Court will order the public records be sealed including, but not necessarily limited to prosecutor s offices, police departments, the Ohio Bureau of Criminal Identification and Investigations, and the Ohio Department of Rehabilitation and Correction. The Court records are public documents and as such available to the general public in person and on-line. Certain organizations may have obtained these public records concerning your particular case prior to any Order sealing them. The Court has no way of knowing whether that occurred and has no control over the use of those records. 9 (12) By the attorney general or an authorized employee of the attorney general or a court for purposes of determining a person's classification pursuant to Chapter of the Revised Code; (13) By a court, the registrar of motor vehicles, a prosecuting attorney or the prosecuting attorney's assistants, or a law enforcement officer for the purpose of assessing points against a person under section of the Revised Code or for taking action with regard to points assessed. When the nature and character of the offense with which a person is to be charged would be affected by the information, it may be used for the purpose of charging the person with an offense. (E) In any criminal proceeding, proof of any otherwise admissible prior conviction may be introduced and proved, notwithstanding the fact that for any such prior conviction an order of sealing previously was issued pursuant to sections to of the Revised Code. (F) The person or governmental agency, office, or department that maintains sealed records pertaining to convictions or bail forfeitures that have been sealed pursuant to this section may maintain a manual or computerized index to the sealed records. The index shall contain only the name of, and alphanumeric identifiers that relate to, the persons who are the subject of the sealed records, the word "sealed," and the name of the person, agency, office, or department that has custody of the sealed records, and shall not contain the name of the crime committed. The index shall be made available by the person who has custody of the sealed records only for the purposes set forth in divisions (C), (D), and (E) of this section. (G) Notwithstanding any provision of this section or section of the Revised Code that requires otherwise, a board of education of a city, local, exempted village, or joint vocational school district that maintains records of an individual who has been permanently excluded under sections and of the Revised Code is permitted to maintain records regarding a conviction that was used as the basis for the individual's permanent exclusion, regardless of a court order to seal the record. An order issued under this section to seal the record of a conviction does not revoke the adjudication order of the superintendent of public instruction to permanently exclude the individual who is the subject of the sealing order. 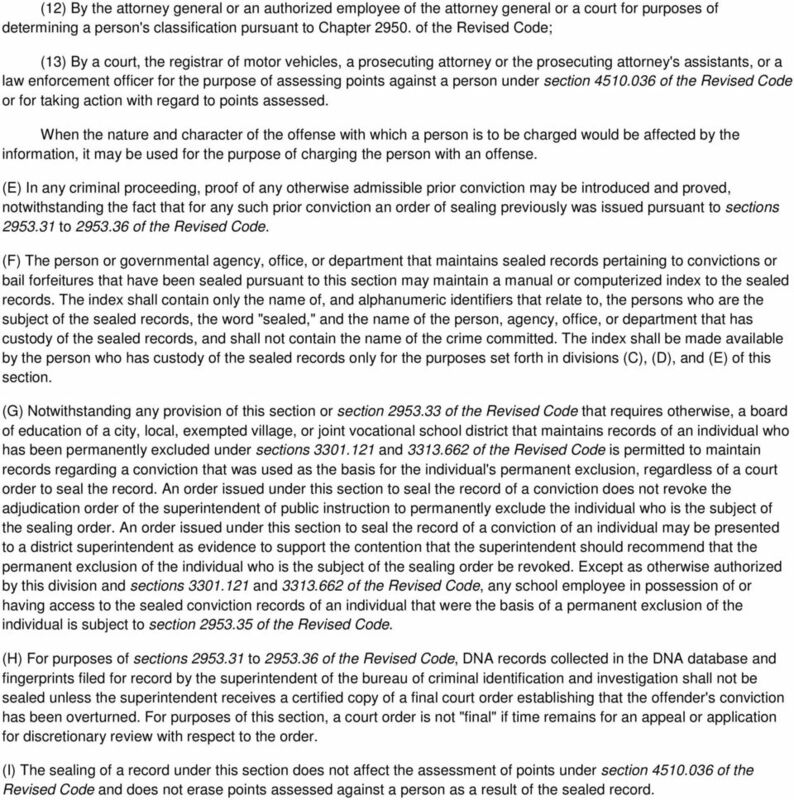 An order issued under this section to seal the record of a conviction of an individual may be presented to a district superintendent as evidence to support the contention that the superintendent should recommend that the permanent exclusion of the individual who is the subject of the sealing order be revoked. Except as otherwise authorized by this division and sections and of the Revised Code, any school employee in possession of or having access to the sealed conviction records of an individual that were the basis of a permanent exclusion of the individual is subject to section of the Revised Code. 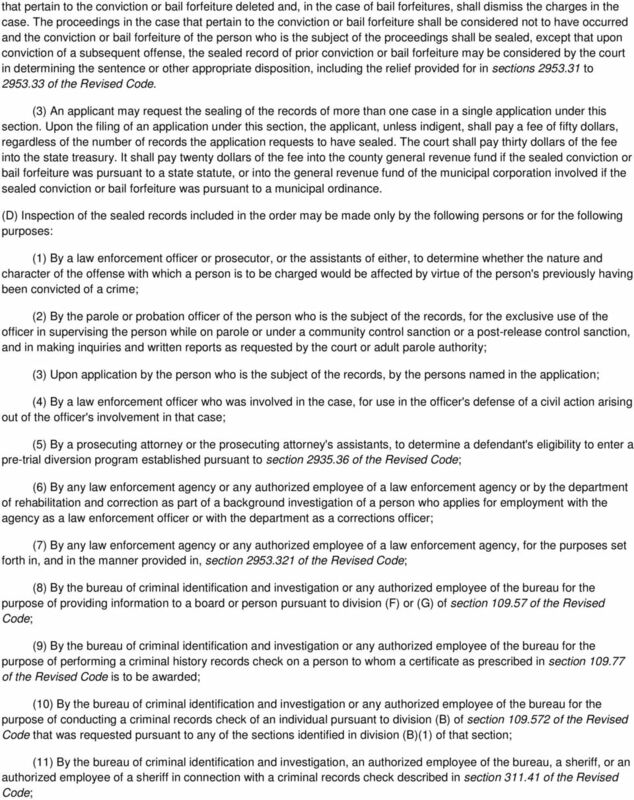 (H) For purposes of sections to of the Revised Code, DNA records collected in the DNA database and fingerprints filed for record by the superintendent of the bureau of criminal identification and investigation shall not be sealed unless the superintendent receives a certified copy of a final court order establishing that the offender's conviction has been overturned. For purposes of this section, a court order is not "final" if time remains for an appeal or application for discretionary review with respect to the order. (I) The sealing of a record under this section does not affect the assessment of points under section of the Revised Code and does not erase points assessed against a person as a result of the sealed record. 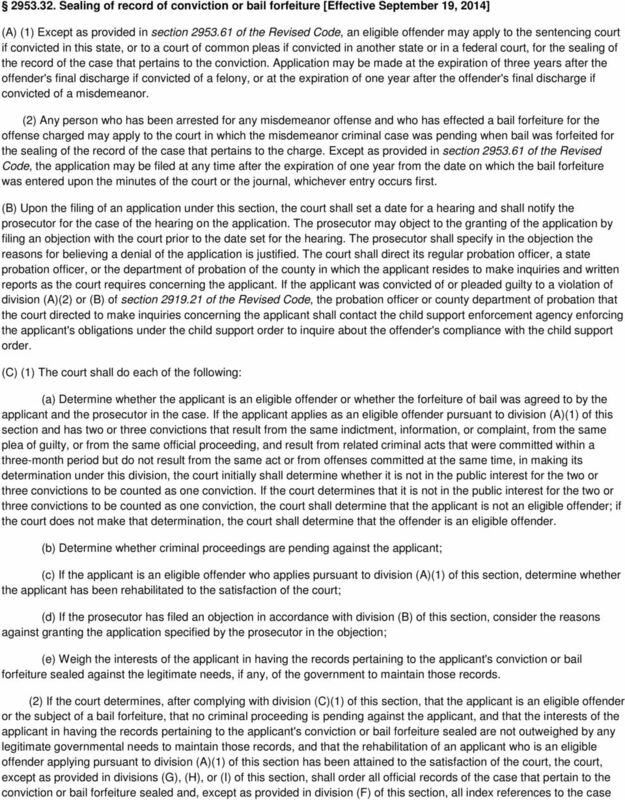 10 Sealing of records in cases of multiple charges [Effective September 19, 2014] (A) Except as provided in division (B) of this section, a person charged with two or more offenses as a result of or in connection with the same act may not apply to the court pursuant to section or of the Revised Code for the sealing of the person's record in relation to any of the charges when at least one of the charges has a final disposition that is different from the final disposition of the other charges until such time as the person would be able to apply to the court and have all of the records pertaining to all of those charges sealed pursuant to section or of the Revised Code. (B) When a person is charged with two or more offenses as a result of or in connection with the same act and the final disposition of one, and only one, of the charges is a conviction under any section of Chapter 4507., 4510., 4511., or 4549., other than section or of the Revised Code, or under a municipal ordinance that is substantially similar to any section other than section or of the Revised Code contained in any of those chapters, and if the records pertaining to all the other charges would be eligible for sealing under section of the Revised Code in the absence of that conviction, the court may order that the records pertaining to all the charges be sealed. In such a case, the court shall not order that only a portion of the records be sealed.